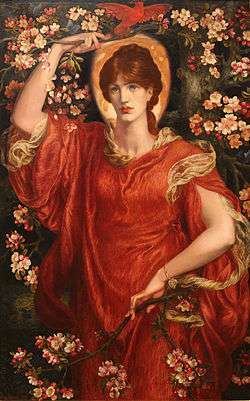 A Vision of Fiammetta is an oil painting in the Pre-Raphaelite which was created by Dante Gabriel Rossetti in 1878. The painting was one half of one of Rossetti's "double works", accompanying his Ballads and Sonnets (1881). Maria Spartali Stillman modelled for the painting. The subject of painting is Boccacio's muse named Fiammetta. The painting was originally in the possession of William Alfred Turner (1839-1886), a businessman, director for a time of the Edison Electric Lighting Company, who owned Joli cœur (1867 Manchester City Art Gallery), Water Willow, a chalk study for La Bella Mano, another one for Mnemosyne (1876, and the oil version of Proserpine (1877 collection privée). Through a sequence of other owners A Vision of Fiammetta has now found its way into the collection of Lord Andrew Lloyd Webber. 1 2 A Vision of Fiammetta, Dante Gabriel Rossetti Archive. ↑ [Stephen Wildman, Waking Dreams : The collection of Samuel Bancroft Junior, Delaware Art Museum, Wilmington, 2004], Waking Dreams.